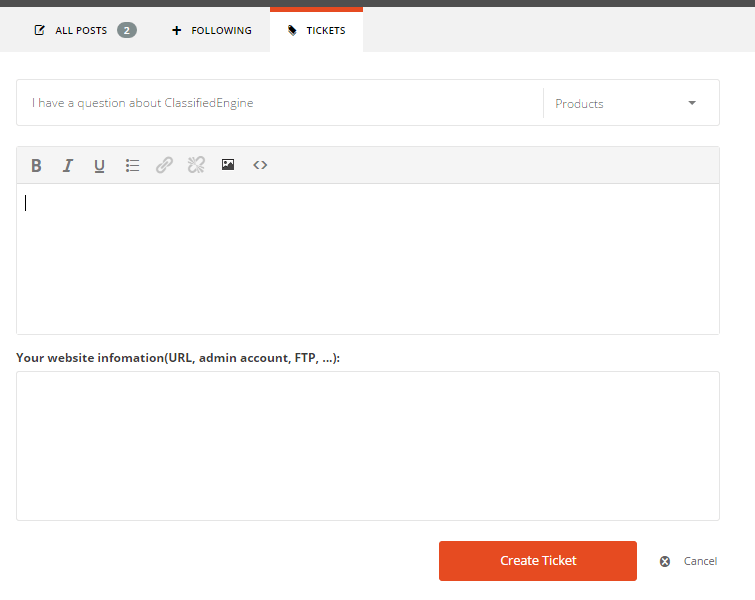 In an effort to provide better support service to EngineThemes’ customers, we would like to introduce a new support tool in our Forum: Ticket system. Customers will see a tab named “Ticket” on the header next to the usual options. The ticket system allows you to communicate your problem with our support team one on one without publishing it to forum. Simply select the product category, click on the content section and put in the question. Also, you can provide additional information about your site so that our technical support staff can easily find out the problem. Once you fill in the form, you can immediately see who will directly take care of your case in the “Assigned to” section. Whenever he answers your question, you’ll receive a notification email to keep track with what’s going on. The support staff then has to follow up, help you until all the all the issues have gone and the ticket is marked as “Resolved”. Ticket system accelerates the process of communication, thus makes thing run faster and smoother. You can easily observe the progress of solving the issues and won’t be distracted by other elements. The system has been a big thing on our new year resolution’s list to enhance the customer service quality. Let us know what you think about this system.